For a real taste of Alaska’s exciting gold rush past, a visit to Skagway is definitely in order. Cries of “Gold in the Yukon” still echo, the sounds of barroom pianos and boomtown crowds ring out in the night, and the romance of yesteryear can be found on every street corner. Skagway is the ”Gateway to the Klondike,” sitting at the head of the Inside Passage connecting the Marine Highway to the Klondike Highway and the gold country of the north. This historic Gold Rush town saw tens of thousands of prospectors in search of gold during the great Klondike Gold Rush of 1898. They got off steamships to head overland to the Canadian gold fields on the White Pass Trail from Skagway or the Chilkoot Trail from Dyea. The White Pass & Yukon Route Railroad was completed in 1900 to assist Klondike Gold Rush stampeders crossing the rugged mountains. Today you can enjoy the “Scenic Railway of the World” with an unforgettable tour over this famous railroad. The train leaves Skagway several times a day from May through September. 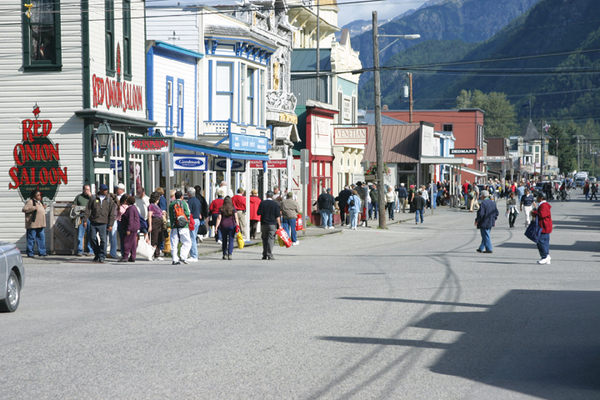 In this delightful community, situated near the mouth of the Skagway River among the towering peaks of the Coastal Mountains, the glittery legacy of the Klondike gold rush days lives on, thanks to the spirited townspeople and a unique preservation program that makes every visit to Skagway a journey back to Alaska’s gold-tinted past. The heart of the downtown area has been designated as part of the Klondike Gold Rush National Historical Park, thereby preserving most of the buildings in town as well as the city’s landscape and spirit. Scores of original buildings lining Broadway have been meticulously restored and now are unique gift shops and impressive artisan galleries. Bawdy saloons and costumed residents recall the colorful excitement of ’98, when lonely prospectors faced the temptations of eighty saloons, the lure of painted ladies and the quick fingers of gamblers and thieves such as Jefferson “Soapy” Smith and his ruthless gang. 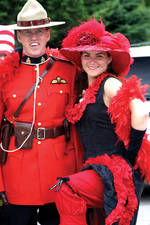 With tourism as Skagway’s number one source of income, the townspeople have created an exciting variety of activities and the opportunities awaiting travelers are as varied today as they were years ago. 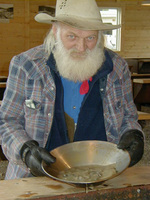 Travel the Klondike Highway by motor coach or tour a gold-mining camp and visit with prospectors while panning for gold. Whatever is found may be kept! Visitors have also enjoyed the extreme entertainment of a raucous and rollicking look at the past seen through the eyes of a brothel madam on “Dolly’s Wildlife Adventure Tour” which takes visitors to Dyea and the trailhead of the famous Chilkoot Trail. For the adventuresome, Skagway serves as trailhead for a magnificent but arduous three-to-six-day hike on the Chilkoot Trail, the same path taken by the Gold Rush prospectors to the Yukon Klondike gold fields. Backcountry enthusiasts can follow the Chilkoot for a tough 33 miles from the Taiya River Bridge over Chilkoot Pass to Lake Bennett in British Columbia. Discouraged gold miners discarded their supplies as they headed home, so it’s still possible to find old pick axes, wagon wheels, shovels and countless smaller items along the route. Rail service returns hikers to Skagway from Lake Bennett. A local helicopter tour of spectacular Glacier Bay or any of the local glaciers comes highly recommended. The Skagway City Museum is located in City Hall at 7th and Spring, one block west of Broadway. 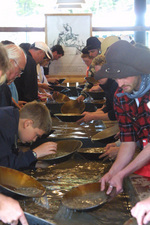 Housed within its walls are a treasure trove of Gold Rush artifacts, local history, native culture exhibit and an outdoor display featuring an original steam locomotive. The Gold Rush Cemetery, where villains and heroes lie side by side, is about a mile out of town. Among notable past residents buried in the cemetery are “Soapy” Smith and Frank Reid, the local hero who ended Smith’s reign of terror in a shootout on July 8, 1898. See a show depicting this story at Goldrush Productions. 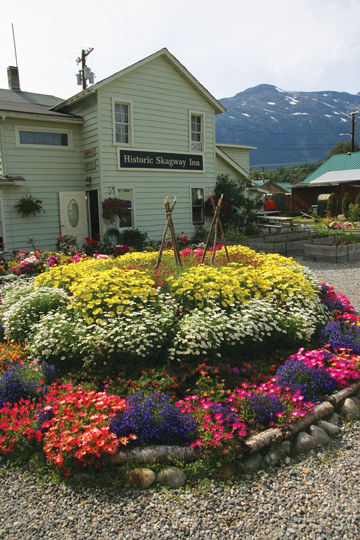 Take a self-guided walking tour of Jewell Gardens in Skagway. Jewell Gardens were planted on the historic Clark farm, which was set up during the Gold Rush and continued to supply produce to Skagway until the 1940s. The gardens contain a wide variety of herbs, flowers, trees and plants. As you walk around various beds of delphiniums, purple robe saxifrage, forsythia and rhododendrons, feel free to nibble on the strawberries that line the boardwalk. Vegetables in the gardens often grow to enormous proportions due to the summer “Midnight Sun.” Look for giant cabbages and acres of rhubarb. After your walk through the flora, relax in the sunroom with a piece of homemade rhubarb pie and tea. A variety of fine restaurants offer a wide selection of choice cuisine. Located in the historic Skagway Inn, Olivia’s Bistro Restaurant overlooks their award-winning kitchen-production and organic flower garden supplying vegetables, greens and herbs for their seafood and wild game meat menu. 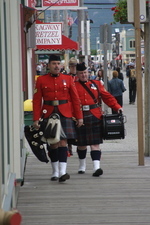 Skagway’s climate is mild and surprisingly dry for a coastal location. The average annual precipitation is less than 29 inches. 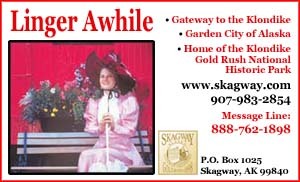 You won’t need special clothing to enjoy Skagway during the spring and summer months. Dress casually for daytime trips. It is wise to pack a rainproof coat and sweater, or a medium weight coat if you are planning to be cruising out on the open water. Comfortable shoes are a must for the walking tours in town. 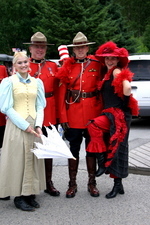 Skagway is famous for its hospitality. You will find a large and varied selection of accommodations waiting for you. Reservations are strongly recommended during the busy summer months. Juneau is the primary domestic air entry point for Southeast Alaska and travelers on the Inside Passage. Juneau is served by Alaska Airlines and three local air carriers who offer several flights daily between Juneau and Skagway. Skagway is 45 minutes by air. To combine the best of flight seeing and cruising, consider flying to Skagway and returning to Juneau by the state ferry system. An excursion from Juneau can be completed in one day, thanks to the long summer days. Whitehorse is also a convenient point of entry for air arrivals. The scenic route between Whitehorse and Skagway is served by both motor coach and rail. A ticket on the historic White Pass and Yukon Route Railroad includes bus service between Whitehorse and Fraser, British Columbia via the Klondike Highway. At Fraser you’ll board the narrow-gauge railroad for the rest of your journey to Skagway. This is a spectacular trip over White Pass and the famous Trail of ’98 Gold Rush route. Skagway is a popular port on the Alaska Marine Highway System. A fleet of modern, car-carrying vessels serves all of Southeast Alaska. Northbound travelers can access the system at Bellingham, Washington and Prince Rupert, British Columbia; southbound travelers usually embark at Haines or Skagway. Some vessels have an observation lounge, bar, cafeteria and solarium where camping is allowed free of charge. Mainline vessels also feature stateroom accommodations. If you are traveling by car or RV, you’ll join the growing number of visitors who travel the Alaska Highway each year. 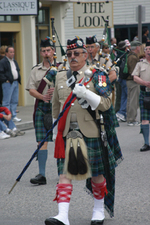 Skagway is only 110 miles south from the Alaska Highway, via the South Klondike Highway. The lakes of the Yukon and British Columbia that you’ll pass along the way are the headwaters of the great Yukon River. This modern two-lane highway is an easy drive and passes through the historic community of Carcross, with hotel, gas, food and other visitor services available, and past the ruins of the Venus Mine on Windy Arm of Tagish Lake. Near the summit of the Klondike Highway Pass you’ll encounter a scene that resembles a moonscape more than any earthly vista. Ancient, twisted trees cling to rocks polished smooth by prehistoric glaciers, or crumbled by years of erosion. Waterfalls, glaciers and glimpses of the White Pass & Yukon Route Railroad and White Pass Trail are among the highlights of the drive from the summit to seaside Skagway. Created by the people of Skagway and depicting events taken from actual historical records, The Days of ‘98 Show with Soapy Smith portrays the last day of this notorious outlaw’s life on July 8, l898. Jefferson Randolph “Soapy” Smith was born in Georgia in l861 and ventured west as a young man. He learned his trade as a con man during the silver and gold rushes of Colorado and eventually made it to Skagway in the fall of 1897. 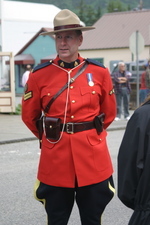 Skagway at that time was described by Canadian Mountie Sam Steele as “a little better than hell on earth!” Soapy formed a gang and reigned supreme for nine months. While his men did most of the dirty work, Soapy tried to establish himself as a solid citizen, contributing to the building of Skagway’s first church and founding an “Adopt a Dog” program. When Soapy’s gang robbed a man of his gold dust, tempers flared and events culminated in a final showdown. The audience witnesses this historic moment and the conclusion to the story, keeping Skagway’s colorful history alive. The Days of ‘98 Show features can-can dancing, ragtime music and Robert Service poetry. Visitors can see The Days of 98 Show in the beautifully restored Eagles Hall, located at 6th and Broadway in downtown Skagway. There are up to four shows daily, starting at 10:30. Phone (907) 983-2545 or visit www.thedaysof98show.com for additional information. The White Pass & Yukon Route Railroad, a narrow gauge rail line, offers several different scenic train excursions from Skagway along the first 67.5 miles of the original 110-mile route that once connected Skagway, Alaska with Whitehorse, Yukon Territory. The journey traces the historic “Trail of ’98” which led thousands of gold-seekers from the staging grounds at Skagway to the gold fields of the Klondike in Canada’s Yukon Territory. Today the railway provides passenger service in comfortable restored and replica coaches pulled by diesel-electric locomotives through the coastal mountains between Skagway and Carcross, YT, along Lake Bennett in British Columbia. Construction of the WP&YR began in 1898 during the height of the Klondike Gold Rush and was completed only 26 months later in July 1900. At the time, construction was considered to be one of the greatest feats of modern history. The $10 million project involved 450 tons of explosives and tens of thousands of men laboring in harsh and challenging conditions to construct this breathtaking engineering model. In l994, the railway was designated an International Historic Civil Engineering Landmark, a designation shared with the Panama Canal, Eiffel Tower and Statue of Liberty. One of the Railroad’s most popular excursions is a three-hour, forty-mile round trip from sea level up to the 2865 foot summit of White Pass, considered one of the world’s most spectacular train rides, with steep grades and cliff-hanging turns. The fully narrated tour features two tunnels, sky-high trestles and bridges, historic sites and spectacular scenery affording panoramic views of glaciers, gorges and cascading waterfalls. The steel cantilever bridge was the tallest of its kind in the world when it was constructed in 1901. White Pass & Yukon Route evolved into a fully integrated transportation company operating docks, trains, stage coaches, sleighs, buses, paddle wheelers, trucks, ships, airplanes, hotels and pipelines, ultimately pioneering the innovative inter-modal (ship-train-truck) movement of containers. The company suspended operations in 1982 when Yukon’s mining industry collapsed due to low mineral prices. The railway was reopened in 1988 as a seasonal tourism operation and today carries over 380,000 passengers during the May to September tourism season. Come discover your own personal gold rush with the White Pass & Yukon Route Railway as it steams through its second century of history. For detailed information, visit their website at www.wpyr.com; phone: 1-800-343-7373; fax: (907) 983-2734; PO Box 435 Skagway, AK 99840-0435; 231 Second Avenue; email: info@wpyr.com; facebook.com/whitepassrail. Summit Excursion trains are wheelchair accessible. Reservations are highly recommended. 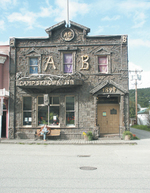 Now a National Historic Building, the Red Onion Saloon was Skagway’s most exclusive bordello. Built in 1897 with planks cut by the founder of Skagway, Captain William Moore, the Red Onion Saloon opened for business in 1898, serving alcohol on the first floor while the upper floor satisfied more than the prospector’s thirst. The brothel consisted of ten tiny cubicles, called cribs, each ten foot by ten foot with three exits, one into the hallway and one into each of the adjoining rooms. To decorate their cribs, the women stretched linen across the rough planks, and then glued wallpaper to the cloth. Remnants of the original wallpapers still cling to the planks. Some of the girls who worked in Skagway were Birdie Ash, Big Dessie, Popcorn Lil, the Oregon Mare, Babe Davenport, Pea Hull Annie, Kitty Faith, the Belle of Skagway and Klondike Kate. By late 1899, business began to suffer and most of the women moved north to Dawson, which was closer to the gold fields and had big gambling casinos and dance halls. As the railroad became the center of business for Skagway, numerous buildings were moved closer to the depot. The Red Onion was moved in 1914 with one horse from Sixth and State Street to its current Broadway location. Unfortunately, the Onion was dragged around the corner backwards and the front and back of the building had to be removed in order to switch them. The trail is a National Historic Site of Canada in British Columbia, and is part of Klondike Gold Rush National Historical Park in the United States. The Chilkoot Trail and Dyea Site were designated a U.S. National Historic Landmark in 1978. In 1998, Chilkoot Trail National Historic Site in BC joined the US Park to form the Klondike Gold Rush International Historical Park. Information and maps are available from the National Park Service at the old train depot in Skagway. Be sure to check in with the Park Service before departing. 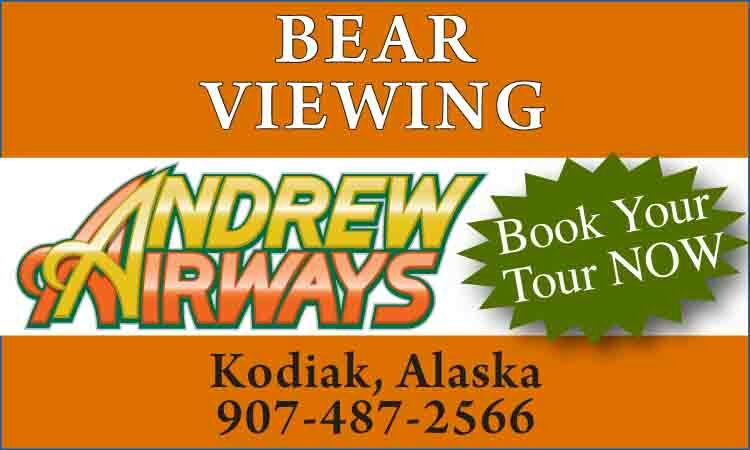 For information and maps before you go, write to the Superintendent, Klondike Gold Rush National Historical Park, PO Box 517, Skagway, AK 99840; 907-983-2921 or 800-661-0486. You must pre-clear Canadian customs by calling 403-821-4111. The White Pass and Yukon Route Train is available every day from Lake Bennett back to Skagway. One fall my friend Anna wanted to take a drive out to the trailhead of the famous Chilkoot Trail in Dyea, Alaska. The old town of Dyea is located 10 miles outside of Skagway and it was a bustling town of 10,000 people back in 1898 during the stampede of gold rush days. Steamships full of prospectors with gold fever came from all over the world to climb the famous White Pass Trail or the Chilkoot Trail, making their way up to the gold fields in Dawson City. Each stampeder had to haul 2,000 pounds of goods to have provisions to last them an entire year in the Yukon. It took about a year to complete the trek to Dawson City in temperatures reaching 50 below zero, through 70 feet of snow. By the time everyone got there, most of the claims had already been staked, so they had to turn around and spend another year getting home. There were a lot of hardships back then. All the tourists had left for the season and it was a beautiful peaceful day. The leaves were changing colors from yellow to orange to red, and as the sun glistened on the fallen golden leaves they looked like real gold nuggets on the ground. We took a picnic lunch and decided to enjoy God’s beautiful creation. I do “Dolly’s Wildlife Adventure” tour in Dyea during the summertime, so we were hoping to see some bears before they went into hibernation. Anna and I drove around looking for wildlife and we saw seals and otters and eagles, but we really wanted to see the bears. We looked in all their usual fishing spots, then gave up and decided to take a break, pulling off by the Taiya river to have a wonderful picnic of Brie cheese and apples and chocolate decadent cookies. Our goodies were spread out all over the dashboard and we were sitting in the sun, relaxing and enjoying the view of the river and the mountains. I will never forget the peace we felt. There was a car parked next to ours and we figured someone was out hiking or fishing. Then a couple walked up and said, “Hello Dolly, how’s it goin’ today, beautiful day.” I said “Yes, we are so enjoying ourselves.” Anna’s phone rang and it was her son from Colorado, so she walked over to the river to talk to him about our peaceful day. The car windows were down and I was looking out the passenger window chatting with the hikers. I called them angels and you will see why in a moment. All of a sudden the guy yelled “BEAR! !” I turned around and lo and behold, coming out of a thicket was a HUGE grizzly bear 20 feet away moving right toward me. He must have smelled our delicious lunch. I yelled over toward the river, “Anna, Anna it’s a bear, come quick!” I started the car, rolled up the window as fast as I could and drove to get Anna as the bear ran quickly behind my car into the campground. Anna was shocked as she had never even seen a bear before, let alone a huge griz that close. I have names for all the bears in the area and recognized him as “Patches.” Anna got in the car and I said, “Let’s head back into the campground and get a better look at him and see where he is going.” There is one li’l biddy road back into the campground. I crept back in there slowly, watching for Patches, who had gone down by the river not far off the road. When he saw us he stood up, sniffing. Man, he was BIG. That really freaked me out, so I turned around quickly and he started coming towards us, about 15 feet away. I stepped on the gas and gunned it out of there saying, “Praise the Lord, we made it! !” I will never ever again go looking for a grizzly in the woods on a narrow one-way road. The snows came and the bears have been in hibernation all winter, but within the next few months Patches and the whole gang will be out to greet us, the females bringing their young ones into the world for us to see and love. I have such respect for these beautiful creatures and I plan to view them again many times, from afar.